It is the small details from Bunny Austin's life that reveal just how long ago it was that a British man won a Wimbledon semi-final. Austin introduced shorts to a tennis wardrobe that previously consisted only of flannel trousers, played socially with Charlie Chaplin and had cameo roles in several Alfred Hitchcock films. 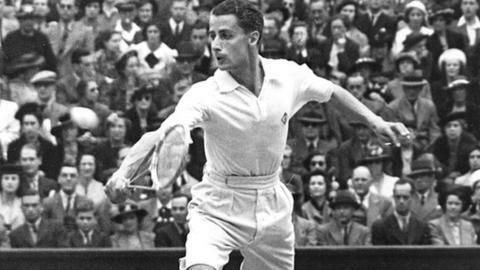 Henner Henkel, the German he beat in the semi-finals to make the 1938 Wimbledon final, died four years later at the Battle of Stalingrad. Since Austin's win, and subsequent straight-sets defeat by American Don Budge in the final, 11 British men have stood on the verge on the Wimbledon final. None of them have been able to make it through to the final day of the championships. Mike Sangster, a 20-year-old from Devon, was the first Briton since Fred Perry to reach semi-finals at Wimbledon, the US and French Open. He was well beaten by American McKinley, who in turn lost in straight sets to Australian great Rod Laver in the final - the first of his four Wimbledon titles. Sangster was given expenses of £20 for reaching the last eight of the tournament, with an £8 gift voucher as a reward for his performance. He died of a heart attack in 1985, aged 44. Taylor went on to win two Grand Slams doubles titles at the US Open, but could not quite produce that success in the singles game. After losing the opening set against Bungert, the Yorkshireman led two sets to one and was threatening to inflicit a third All England semi-final defeat on the German. However Bungert blasted his way back to victory with a big serve that finally overpowered Taylor in five sets. Like McKinley, Bungert was beaten in straight sets in the final as an Australian legend - this time John Newcombe - collected his first Wimbledon title. Taylor had raised expectations with a sensational win over top-seed Laver in the fourth round, but this was the most comprehensive of his three semi-final defeats at Wimbledon as he was outfoxed by the 35-year-old Rosewall's guile and subtlety. If Taylor was to lose to someon,e though, then the Australian may have been the choice of the local fans. Rosewall's victory meant it was a record-breaking 16 years between his first appearance in a Wimbledon final and his latest. But despite the vociferous support of the home fans, he could not improve on his two defeats of 1954 and 1956 as Newcombe triumphed 5-7 6-3 6-2 3-6 6-1. Thirteen of the 16 men's seeds had withdrawn from the tournament in protest at the suspension of Yugoslavian Nikki Pilic by his domestic federation, creating a great opportunity for Taylor to mount an assault on the title. Taylor had disposed of a 17-year-old Bjorn Borg in the quarter-finals, and led 5-4 in the final set against Kodes before the British weather, not for the last time, conspired against the home favourite at the All England Club. As the rain came down, the match was initially postponed. Taylor had changed out of his kit and most of the crowd had headed home when tournament referee Captain Michael Gibson decided to summon the players back onto court. In the gathering gloom and on a skiddy surface, Taylor, who was taller than his Czechslovakian opponent, was outmanoeuvred, losing three straight games to surrender the match. Taylor replaced David Lloyd as Davis Cup captain in February 2000, a post he kept for four years. Henman had lost to Sampras in the second round in 1995, the same year he had been disqualified from the doubles tournament for hitting a ball girl with a tennis ball. A lot had changed since then, as Henman won over the crowd with two giant-killing runs to the last eight and climbed 156 ranking places to 18th in the world. Unfortunately, the gap between him and Sampras remained. Henman twice broke the defending champion as he won the second set and kept pace for much of the third before Sampras' superior quality and experience told. Sampras overcame Goran Ivansevic 6-7 (2-7) 7-6 (11-9) 6-4 3-6 6-2 in an absorbing final to claim his fifth Wimbledon singles title. Once again Henman's run at SW19 was brought to an abrupt end by his friend and training partner Sampras. Seeded sixth, Henman came out on top in a nervy first set and when Sampras called for the trainer for treatment on a thigh problem in the second it seemed an upset might be brewing. It was not to be, though, as Henman dropped his serve in the 10th and final game of the second set and Sampras levelled the match before grinding his way through in four sets. Perhaps the most famous of British defeats in the men's last four, as Henman was squeezed out in a match that spread its drama over three rain-affected days. Ivanisevic, a three-time runner-up but ranked 125 in the world after a string of injuries, had to rely on a wildcard to ensure his place in the main draw. The Croat seemed to have run his course as Henman swept through the third set in just 15 minutes. However, Henman's momentum was checked as the heavens opened and when the players returned on Saturday, Ivanisevic outgunned the 26-year-old in a fourth-set tie-break. After five games of the decider with Ivanisevic leading 3-2 on serve, the weather intervened once again to force another overnight suspension. On the Sunday that was supposed to host the final, Henman cracked as he attempted to hold serve at 4-3 down. He salvaged two break points but a searing Ivansevic winner claimed a third and it proved to be decisive. In front of a raucous Centre Court crowd made up of those who had queued for the so-called People's Monday, Ivanisevic finally claimed the title with a five-set win over Australian Pat Rafter. For a fourth time, Henman lost to the eventual champion. After the drama of the previous year, though, his defeat at the hands of Lleyton Hewitt was a more downbeat affair. Hewitt had become the youngest player ever to become world number one at the end of 2001 and was in irresistible form as he carved through Henman in two hours 19 minutes. The final was another one-sided affair with Hewitt ripping through Argentine David Nalbandian 6-1 6-3 6-2 to claim his one and only Wimbledon title. Murray was seeded and ranked higher than Roddick, but any expectations he had of making the final were confounded by the American striking excellent form. Roddick landed with 75% of his first serves, but combined his power with a deft touch at the net. The combination put Roddick's serve out of Murray's reach for much of the match and he carried off tie-breaks in the third and fourth sets. It wasn't just Murray who struggled to unlock Roddick's game. Roger Federer took more than four-and-a-quarter hours to overcome him in the final. David Beckham was courtside to lend his support to Murray, but could do nothing to help the Scot as world number one Nadal seized the match's big moments. Murray had a set point on serve in a nip-and-tuck second-set tie-break but he could not convert and a fortunate net cord followed by a brilliant winner put Nadal out of reach. The Spaniard reached his fourth straight final with a typically forceful baseline barrage which similarly overwhelmed Tomas Berdych in straight sets in the final. Murray was left tearful on his chair in the wake of his defeat but could take a crumb of comfort from hitting six more winners than his opponent. After successfully keeping Nadal pinned on his backhand in the opening set, Murray squandered a glorious chance to set up two break points in the fourth game of the second as he pushed an inviting forehand long. The missed opportunity played on Murray's mind, while Nadal played on. Murray coughed up a break in the very next game and more unforced errors at the start of the third set were swiftly punished by Nadal. Murray had the chance to wrest the match back his way with two break points in the fourth game of the fourth set, but Nadal shut down the opening and was not to be reined in.